Saturday our kids attended their first pop concert. We went to see Mitchel Musso. He was performing at Six Flags, free with admission to the park. It was very good. We all like his music so we all had a good time. But my very favorite part was Fritz dancing the Funky Chicken to the music. Every time Adrian talks about Dora the Explorer he always add “and Boots!” When we heard that Dora would be at Six Flags last Saturday we knew we had to take the little boys to see her. They both like Dora a lot. They were both thrilled meeting her. 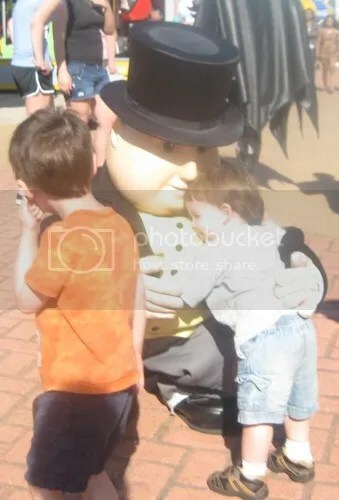 Adrian is terrified of all the costumed characters, including Sir Topham Hatt. Because of that we weren’t sure how he’d react to Dora. We needn’t have worried. He LOVED her and was so incredibly happy that she brought Boots (and Backpack and Map) along. Saturday we went to Six Flags America for the first time. The last time I went there it was still called Adventure World and I was part of filming for a local cable kids’ show I was on. Ani’s been to Sea World in Florida and Cameron’s been to Disney World and Dutch Wonderland in Lancaster, PA, all with my parents. 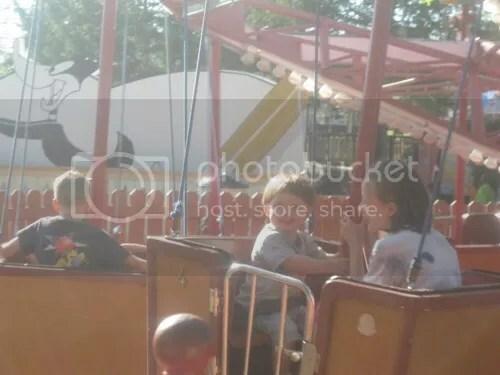 This was the first time they went to an amusement park with us. 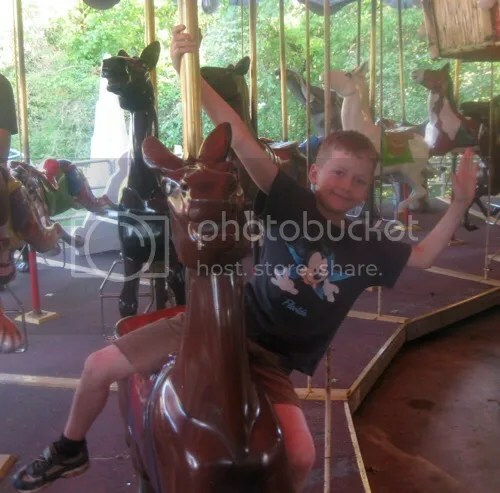 Last summer I got the idea that it would be nice if my uncle gave us a trip to an amusement park for Christmas. We planned to go to Sesame Place. He figured up how much it would cost and gave us $250 to buy the tickets. And then we waited until last week to get the tickets. 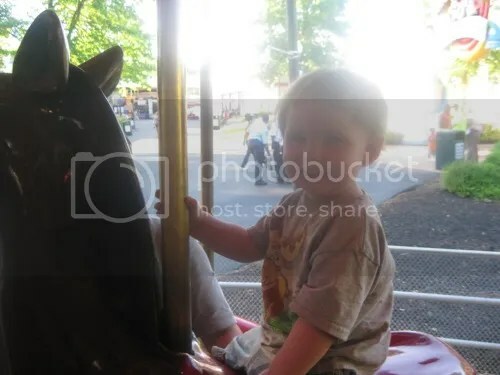 So we went to Sesame Place’s website and were going to get tickets but then Ani and Cameron started saying that maybe they’d rather go to Busch Gardens or King’s Dominion. 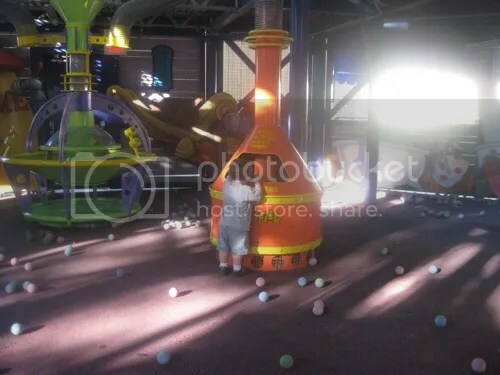 Sesame Place is aimed at ages 2-7 so while it looked fun enough to them, more thrilling roller coasters were on their minds. We go to Williamsburg a lot and we pass King’s Dominion on the way and always say they want to go there. 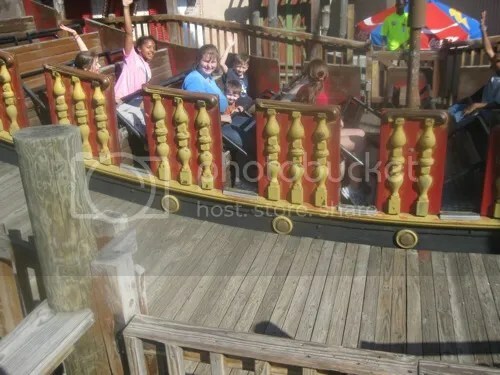 So I briefly looked at Bush Garden’s website and quickly rejected that one. WAY too expensive. So then we decided we would go to King’s Dominion. It’s an hour and a half away so we could go and come back in one day (Sesame Place would require at least one overnight stay). With the money Uncle Ralph gave us, we could even have a picnic lunch at the park. But then I was looking at a list my mom had of prices for tickets to various things and noticed Six Flags America on the list. I said I was surprised I hadn’t thought of it earlier. It’s only 40 minutes away from us. As a teenager I knew a few kids through church who worked there even. 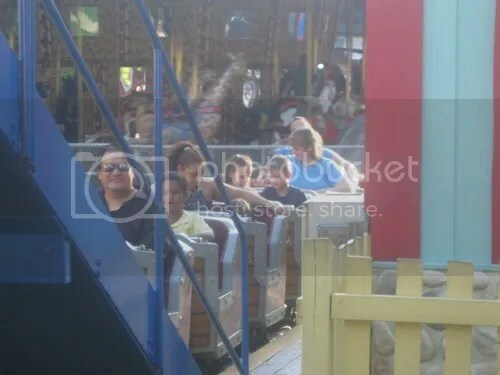 So then I went on their website and we realized that, because of a sale going on this month, we could get 5 season passes (Adrian is free until he turns 3 next year) for the amount of money my uncle had given us. The next morning I ordered our season passes (and added season parking – pays for itself in 3 visits). And so, on Saturday afternoon, we got our plastic season pass cards. With them we can go to Six Flags as many times as we want all through the summer and on through to the Fright Fest in October. Hurricane Harbor (the water park) opens Saturday. Memorial Day starts daily operations which go on until Labor Day when it goes back to weekends only. Cameron and Ani are both tall enough for almost all the roller coasters. There are even a lot of rides Adrian can ride. 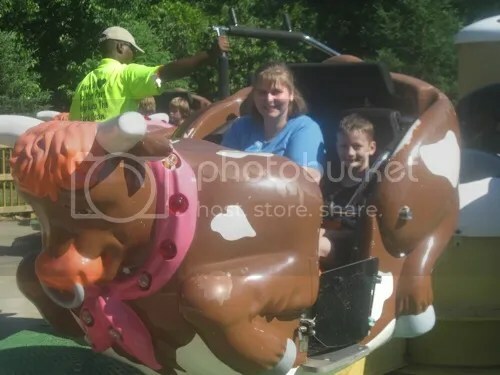 Fritz can ride several rides all by himself. At the moment Cameron is 1/8 of an inch shorter than the maximum for the kiddie rides (only allowed on some when accompanying a small child Adrian’s size). We have plans to go back on Friday since Jamie’s off. Cameron has already asked that we get season passes for next year, too… after going there just one time on this year’s passes.